Six decades after his death, Saadat Hasan Manto continues to haunt us with an uncanny fascination. There is a spurt of literary and cinematic interest in the life and works of one of the strongest literary voices of the subcontinent. Able translators are making his works accessible to the English readership, while the silver screen is turning the spotlight on his life. In the present day world, this renewed exploration of Manto’s writings is not unanticipated, nor is the underlying reason unintelligible. Manto’s controversial works mostly revolved around collective madness fawned by sectarian politics and religious bigotry. Ironically, this theme remains largely relevant in today’s world; and is not just unrestrained but unimpeded and unfathomed. Manto has been called the Maupassant of Urdu short stories. Art by Sharon Irani. Manto has been called the Maupassant of Urdu short stories, and like his French role model, realism is his special field. His subjects are real people with real-life struggles, unhappy victims of their greed, desire, or vanity. But whether he writes about pimps, prostitutes, thieves or gamblers, he presents even the most sordid details of their lives without sermonising. He is acutely conscious of their shortcomings, cruelly realistic in his approach and decidedly objective in his narrative, like an architect who constructs each character with a sense of both honesty and detachment. In Ten Rupees, the adolescent prostitute Sarita is unaware of her circumstances because the dealings with her clients become occasions for her to ride in their fancy motor cars. In Khol Do, the perpetrators of violence during the partition of India are not Indians or Pakistanis, Hindus or Muslims; they are just human beings in their raw, raging barbarity. The underlying themes in these and other stories are insecurity, terror, lust, misery and betrayal. Transcending these is an overarching sense of humanity; herein lies rooted the realism of the master raconteur. Economy is an essential feature of Manto’s writing—he does a lot with only a little bit of space. 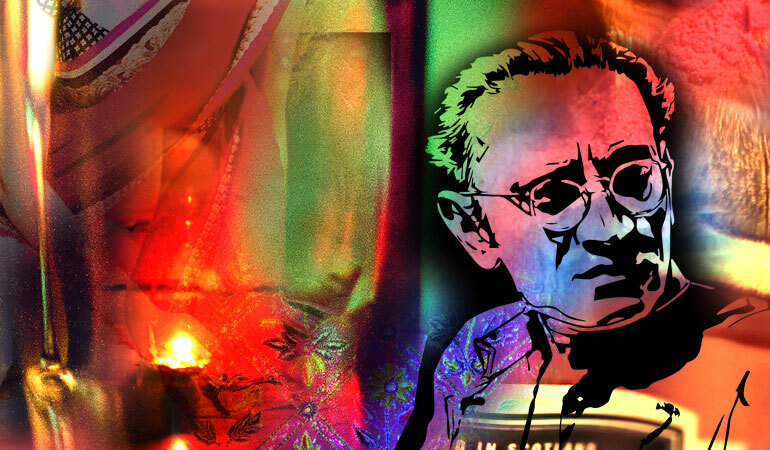 Short sentences, unadorned language, reticence towards the expression of a character’s feelings and a detached narrator are the hallmarks of Manto’s prose. So incredible is his control over timing and pace that he seems to convey an entire lifetime in under ten pages. And it never feels strained or rushed or incomplete. His art is that of a miniaturist, dwelling on specifics with a detailed yet delicate brush. Ten Rupees, for example, is set in Bombay, though Bombay is hardly described. There is a single reference to a yellow car parked outside a long factory wall with the stench of urine drifting down its entire stretch, and that is all. In Blouse, a young man’s first brush with adolescence is matter-of-factly described by a reference to a warm pain followed by a cool ripple through his body. In Khaled Mian, as Mumtaz thinks of whether her child will survive, the stillness of the environment is described poignantly through the horn of a car that grazes the silence of the night. These and other stories are replete with examples that reaffirm the notion of ‘less is more’ in minimalist writing. When it comes to capturing the human dimension of Partition, perhaps no other writer comes close to the oeuvre of Manto. In Manto’s magnum opus Toba Tek Singh, a Sikh patient in a Pakistani asylum climbs up a tree and yells that he does not want to go to Pakistan or India. The fact that Manto lets his “crazy” protagonist voice the only rational thought is not a matter of coincidence; it is intentional and executed with the Mantoesque flair for ironical humour. In The Dog of Tithwal, Manto uses the allegory of an indecisive dog to convey the irrationality of conflict and violence. Thanda Gosht or Cold Flesh, that earned him charges of blasphemy, reveals a shocking element of barbarity—a Sikh who ventures on a round of partition killing and rapes an unconscious Muslim girl, only to find her dead. In all his other Partition stories, there is murder, massacre and mayhem—murder that is methodical and thorough, massacre that is cold-blooded and indiscriminate, mayhem that is frenzied and insane. These are disturbing accounts that shock the reader but are undoubtedly invaluable annals of the greatest mass movement in the history of humanity. The notion of feminism, at the time when Manto was writing, is perhaps different from what it is today. Broadly speaking, raising a voice against exploitative institutions of the society that marginalise women can be held to fall under the purview of feminism. Manto, through his fiction, does this extensively. He plays the role of a spokesperson for the thousands of women whose bodies had become battlefields for hate wars during Partition. The common refrain that echoes across all these tales is that of unspoken pain and agony—whether it is in the tragic forcing into prostitution of Bismillah, the cruel brutalisation of Sakina or the horrific death of Sharifan. Manto also raises fundamental questions about the moral and ethical values regulating the lives of women. In a society where women were perceived as an entity of sexual gratification, Manto empowers his female protagonists to explore complex themes related to gender, sexuality and injustice. In Hattak, Saugandhi is the prostitute with pride who refuses to be shamed by a customer. In License, Nesti determines to uphold her chastity and refuses to earn a livelihood by selling herself. In Mozelle, the beautiful, bold and free-spirited Jewish girl sacrifices herself to save a Sikh man during Sikh-Muslim riots. These women and their stories not only establish his feministic vision but also immortalise the humanist in Manto. Hailing from Kolkata, Ipshita currently lives and works in New York. Though the world of numbers enables her to earn a living, it is the world of words that fascinates her. She is an avid reader and loves to write about things she sees around her, people she meets, and places she travels to.